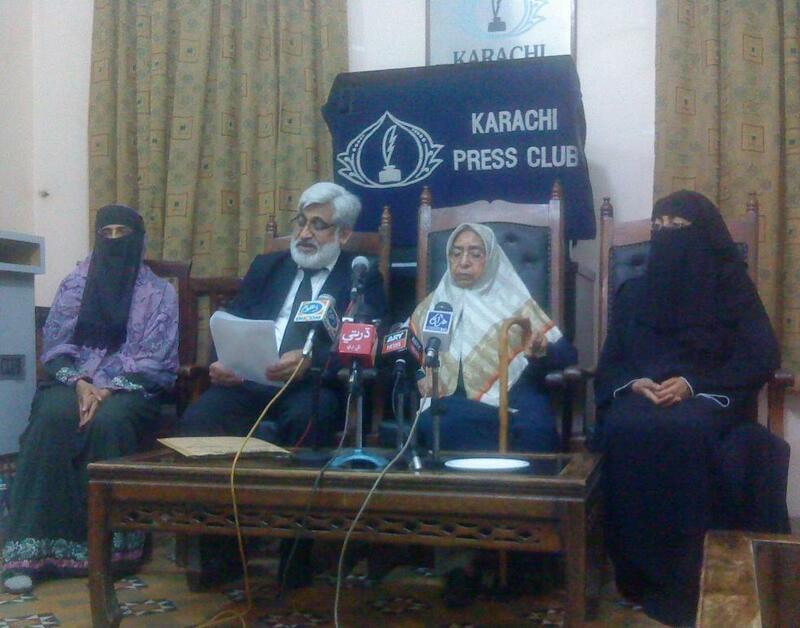 Today, Dr. Ismael Sheikh’s family and lawyer Mr. Umar Hayat Sindhoo, Advocate Supreme Court of Pakistan, held a press conference at Karachi Press Club, Karachi, Sindh. Advocate Umar briefed the media regarding Dr. Ismael Sheikh’s abduction and the judicial process that has so far taken place. Advocate Umar said that by profession Dr. Ismael Sheikh is a dental surgeon. He had been teaching at a renowned dental college before his abduction. Dr. Ismael Sheikh was abducted by government thugs on Friday, 18th of April 2014, after 9:30 a.m., when he left his home, in his white Suzuki Mehran. They seized his car as well, registration number U-4509. The very same day at around 2:00 p.m. around twelve to thirteen men equipped with Kalashnikovs and wearing bullet proof jackets arrived in police mobile vehicles. These plain clothed men forcefully entered his house, violating the sanctity of a house of a Muslim. They did not even give time to his wife and daughters to cover themselves by Hijab. There was no lady official amongst them. These government thugs used abusive language against Dr. Ismael’s wife and turned the whole house upside down. They seized the passports of Dr. Ismael, his wife and daughters, laptops of Dr. Ismael Sheikh and his wife, mobile phones, original, original registration books of two cars, original documents of the ownership of the house, cash of around one hundred thousand Rupees and two gold coins worth around one hundred and fifty thousand Rupees. They fired at the main gate of the house to open it and took away the car, AND-533, of his wife as well. They ruthlessly threatened the wife of Dr. Ismael and his five daughters and scared them severely. The family of Dr. Ismael Sheikh endured their brutal presence for almost 45 minutes remained at the house. Advocate Umar said that on the same day Dr. Ismael Sheikh’s wife registered a written complaint regarding Dr. Ismael’s abduction, attack on the house and theft at the concerned police station and also informed Chief Minister Sindh, Governor Sindh, I.G. Sindh and the Chief Justice of Sindh High Court. On 22nd April 2014 a constitutional petition, number 2094, was filed in Sindh High court and its first hearing took place on 23rd of April 2014 presided by a divisional bench of Justice Sajjad Ali Shah and Justice Sadiq Bhatti. The divisional bench issued notices to the relevant authorities and departments and passed an order to produce Dr. Ismael Sheikh on 30 April 2014. But unfortunately government agencies did not produce him, so the divisional bench ordered the concerned S.H.O to register an F.I.R and set the next hearing for 22nd May 2014. Advocate Umar and the family of Dr. Ismael Sheikh demanded the government and its agencies release Dr. Ismael, for he is a jewel of the Ummah, not a criminal. He also asked the media to play its role in securing his release, by highlighting his unfortunate ordeal. "یہ لوگ اُن ایمان والوں سے کسی چیز کا بدلہ نہیں لے رہے تھے سوائے یہ کہ وہ اللہ غالب لائقِ حمد کی ذات پر ایمان لائے تھے"